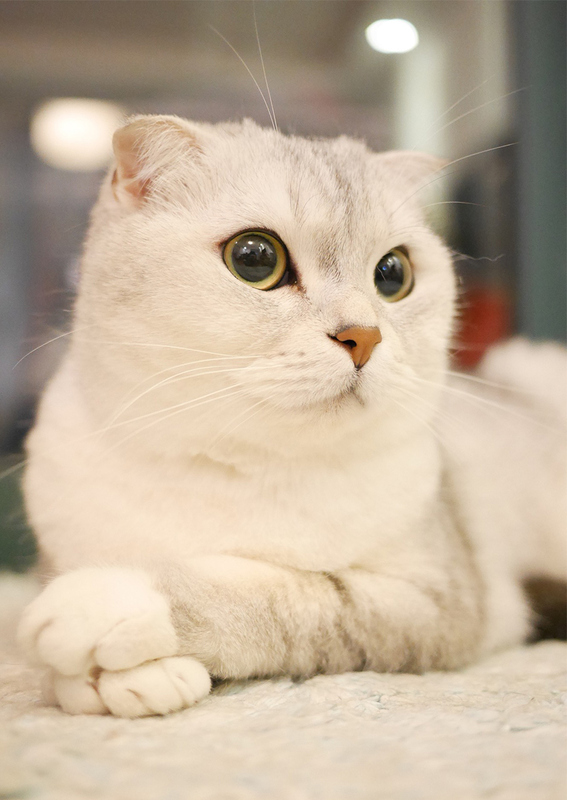 In this article we are going to take a look at the Scottish Fold cat breed. 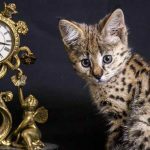 This unusual looking cat has become quite popular in recent years, with their characteristic tilted ears and endearing expressions. Let’s find out where they came from, what they are like and how healthy they are. Helping you to decide whether a Scottish Fold cat is the best breed for you and your family. What Is A Scottish Fold Cat? A Scottish Fold is a cat breed that has been selected to have a very distinctive appearance. They have large round eyes and tipped over ears. These cats originated in Scotland and can all be traced back to one single cat. Scottish Fold history is not very long. The breed was first produced from a single cat in Dundee, Scotland, in the early 1960’s. A shepherd noticed this cat was born with a mutation that affected the cartilage in her ears, and asked the owner if he could have one of her kittens. From this kitten, Susie, a white barn cat, the Scottish Fold breed was born. The shepherd consulted a geneticist, who helped him to breed dozens of kittens from Susie in a very short period of time. Just a few years later there were over thirty folded kittens born, with as many unfolded produced to the same cat. The Scottish Fold cat was granted championship status by the Cat Fanciers’ Association after relatively few years, in the late 1970’s. 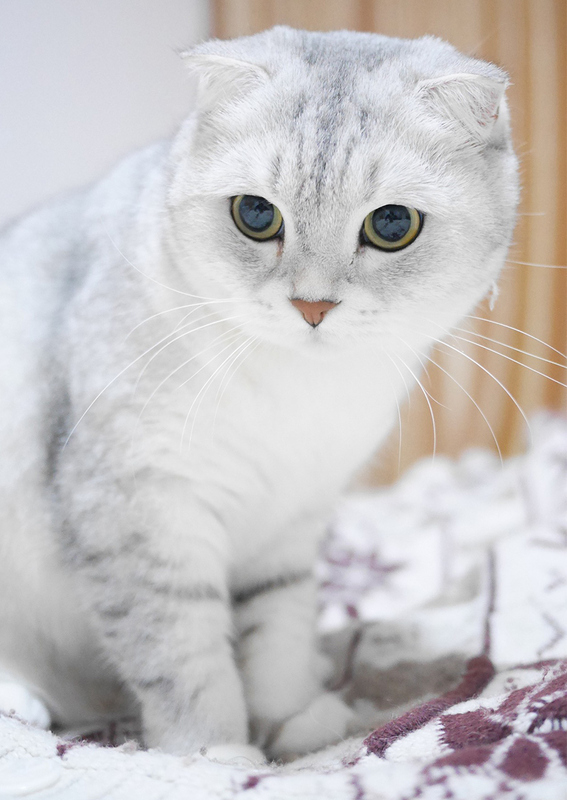 Outcrossing is allowed in this breed to the American Shorthairs and British Shorthairs. The Scottish Fold however has maintained a look unique to him, with a short denies coat, round pads and a short nose. Scottish Fold personality has a big appeal. These charming cats actively seek out and clearly enjoy human company. They all display some fun expressive behaviors, like standing up on their back legs or laying flat on their backs on the floor. These intelligent and interactive cats love to play, often enjoying cat puzzles and even games of fetch. However, Scottish Folds can also suffer from limited range of movement. This is due to the genetic mutation that causes their ears to fold affecting other parts of their body as well. We will look at this more in the health section below. These are sweet, kind cats that thrive on companionship. The only downside of this is that they are therefore not an ideal choice if you work full time or spend much time away from the house. Scottish Folds are often compared in appearance to little owls, with their fluffy coats and tilted ears. At birth these ears will stand up as cat ears normally do, but from three weeks to three months of age the mutated cartilage will stop holding them in place. Giving them the characteristic folded appearance. The tips of their ears are more rounded than most other cat breeds. The Scottish Folds ears can range in position from a single fold, to a double or triple fold. This denotes the extent of the fold, where the single is a tilt halfway up, a double is a fold at this height and a triple lays close to the cats head. However, not all the kittens in a litter of Scottish Folds will necessarily have the mutation that causes their ears to tip at all. And in fact these cats are vital to the breeding programme, as we will see in the health section below. They are not particularly vocal cats, but their voices when heard are slightly tinny, with a chirpy, soft range. Scottish Folds come in long and short haired varieties, with the long haired sometimes being referred to as Highland Fold cats. They have long tails, that can sometimes have a rounded tip. Scottish Fold cats will weigh anywhere from 8 to 13lbs when they are fully grown, making them a medium sized cat breed. 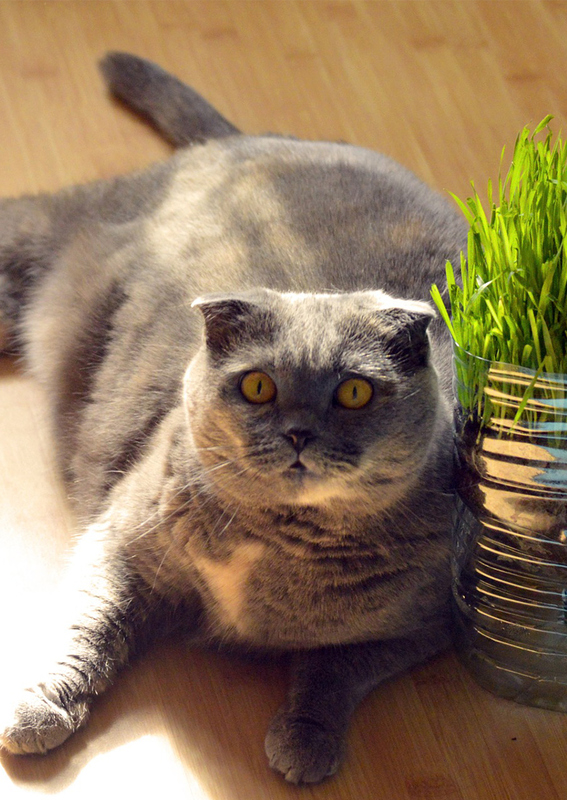 You will need to restrict your Scottish Fold’s diet appropriately to prevent unhealthy weight gain. They can have blue eyes or eyes of differing colors. Ear cleaning is essential for Scottish Fold cats, due to their tipped over ears. Check their ears daily for signs of dirt, discolouration or anything that could be causing discomfort. You might also like to wipe their eyes once a day with a damp piece of cotton wool, to reduce discolouration of the fur under the eyes. Grooming for Scottish Folds depends on their coat length. Those Scottish Fold cats with shorthair need a weekly comb, but long haired Highland Folds should be brushed at least two or three times a week to prevent matting. 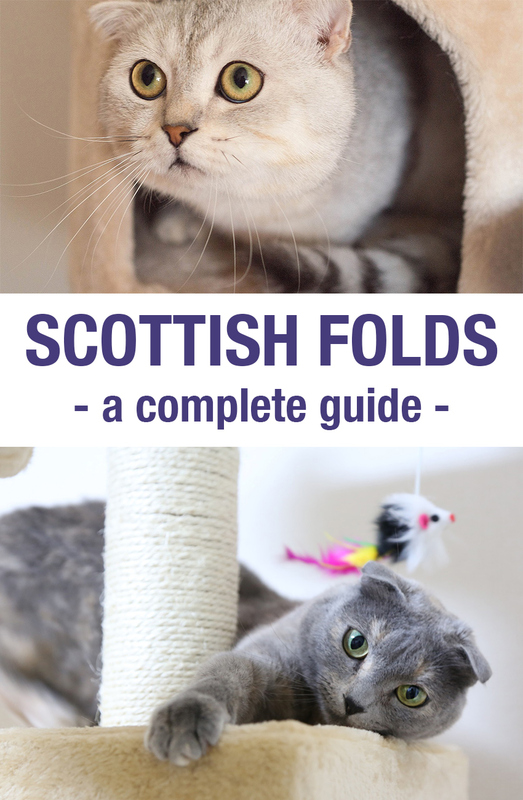 Perhaps unsurprisingly, the big issue when it comes to Scottish Folds is related to their distinctive ears. 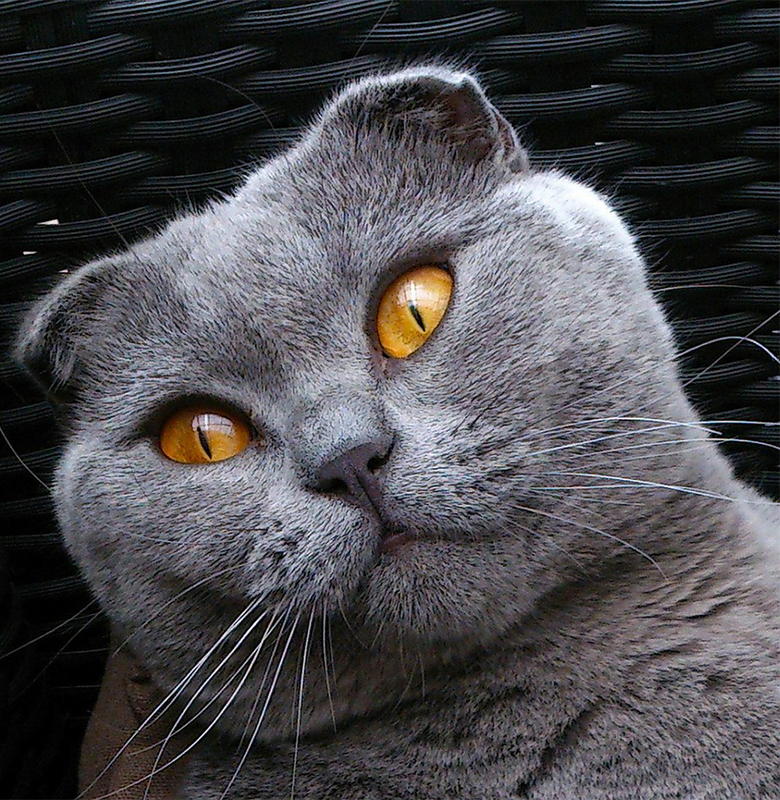 Although Scottish Fold ears might look cute to lots of people, they come at a price to the cat. Tipped ears are not just hard for the cat to keep clean, they provide a more attractive environment to bacteria. It is essential to check a Scottish Fold’s ears and clean them daily to reduce the chances of discomfort or infection. But it’s the hidden problem related to their ears that can cause Scottish Folds the real problems. It’s quite a mouthful, but Osteochondrodysplasia (OCD) is something you need to know about if you are thinking of buying a Scottish Fold kitten. The genetic mutation that causes the Scottish Fold’s ears to bend in this characteristic way, does not only affect their ears. Some people believe that every Scottish Fold has OCD to some extent. The affects the cartilage throughout their bodies. Most commonly the tail, ankles and knees. 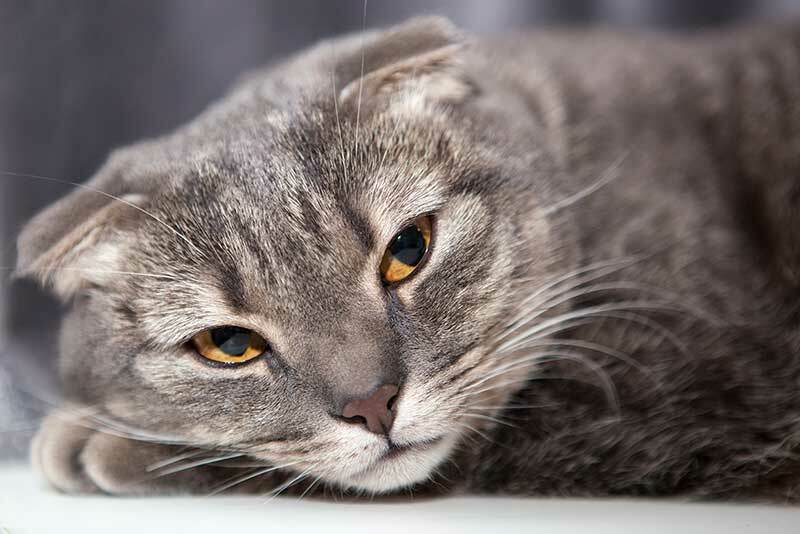 Scottish Folds can therefore suffer from painful, crippling degenerative joint disease. This causes the bones the fuse and prevent them having normal range of movement. You can somewhat reduce the impact of joint problems by keeping your cat at a healthy weight. Obesity can make health problems more severe. Just like you, your cat has two kidneys which act as important filtration units, cleaning waste products from your cat’s bloodstream. 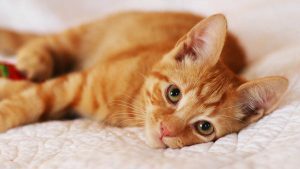 Polycystic Kidney Disease (PKD) is a condition where normal kidney tissue is replaced by cysts, impairing kidney function and ultimately ending in kidney failure and the death of the cat. PKD is inherited – passed down from mother and father cats to their kittens, and there is a genetic test available. Not all cats are susceptible but PKD is a well known problem in Scottish Fold cats, so if you are planning on buying a Scottish Fold kitten, it is vital that you ask to see the test certificates for the parent cats. Scottish Fold cats are also susceptible to familial hypertrophic cardiomyopaty (HCM) a heart condition which results in a thickening of the walls of the chambers of the heart, and reduced heart function. There are three genetic types for Scottish Folds relating to their cartilage and folded ears. They have no fold to their ears and are least likely to have cartilage problems. They are like a Scottish Fold in appearance and personality in every other way. These kittens have only one copy of the mutated gene. They are thought to have noticeable joint problems later in life, but to be less affected earlier on. They may have folded ears. Breeders are warned to avoid breeding two folded Scottish Folds, because those kittens with two mutated gene copies are likely to have joint problems throughout their lives. They will all have folded ears. How Long Do Scottish Fold Cats Live? It is claimed that Scottish Fold cats live on average anywhere between 11 to 15 years, depending upon where you look. Debatably this breed has a long lifespan for an unhealthy cat type, because the health problems affecting Scottish Folds are not life limiting. This does not take away from the fact however that these problems can be very limiting in terms of quality of life. Scottish Fold kittens are incredibly cute, but also quite hard to come by. 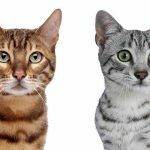 You also need to be aware of what you are taking on when you buy one, and make an informed decision about whether you are happy to commit to a cat with a high possibility of joint problems and ongoing discomfort. Scottish Fold breeders should only ever breed from one parent with folded ears and one without, to help reduce the chances of degenerative joint disease. Many breeders will be producing kittens with a view to showing them. This means that they will want to select the most likely show candidates from the litter. For this reason you will often find that Scottish Fold kittens are not available until they are 12 – 16 weeks of age. This is because the breeder won’t know the extent of their ear folds until that time. At the point you collect your kitten the breeder should have already had them microchipped and give their first vaccinations. Scottish Folds are rare, especially those with tipped over ears. They therefore demand a very high price. How much are Scottish Folds? In the USA Scottish Folds cost $1,000 to $2,000. In the UK Scottish Folds price will be around £600 to £1,200. You will pay a lot less for a straight eared Scottish Fold kitten, and they are more likely to be healthy too. They will still have the same overall appearance (minus the tipped ears) and wonderful personality. Is A Scottish Fold Cat Right For You? Scottish Fold cats get on very well with other animals, children and adapt comfortably to most living situations. They do however have a high need for attention and interaction, so are only suited to homes where somewhere is in for most of the day. 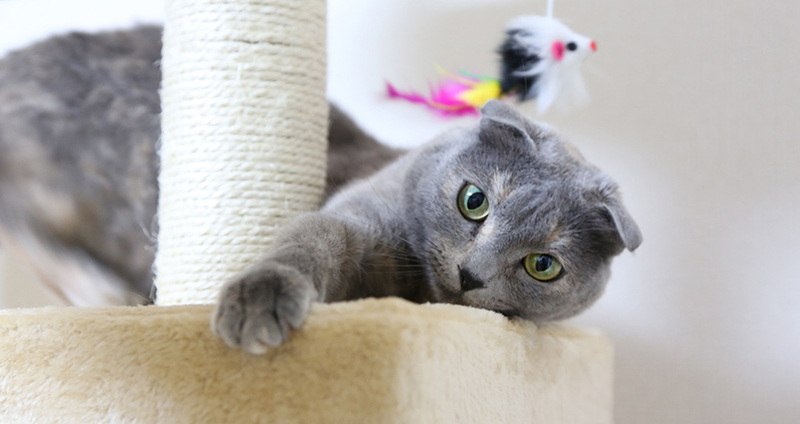 Scottish Folds have special requirements in terms of ear care, and those with entirely tipped ears are quite hard to come by as the mutation is fairly rare. The most important factor you will need to consider however is the possibility of degenerative joint disease. As this breed is fairly rare there are not at present any papers giving exact figures on the rate of these problems, but it is known that they arise as a direct result of the mutation that causes ears to tip. Take the time to consider whether you are comfortable playing a role in a breeding programme that cultivates a gene purely on the basis of it’s cute ear tip, that may well cause these cats an uncomfortable and painful life as a result. If you love their general appearance and temperament, then a straight eared Scottish Fold will have the best chance of a happy, healthy life. Scottish Fold adoption is a great way to get a Scottish Fold cat without contributing to the breeding programmes that are potentially creating health problems for these lines. You didn’t mention pkd or hcm in your story. Pkd is something every breeder should test for same a hcm. No test no buy! Please inform people about these as well. is there any wrong in breeding straight ear scottish fold with folded ear scottish fold? No, this is the preferred way. You are a good person! Keep him! I don’t regret my cat. He is so sweet. I hope you’ve kept the poor little kitty. I myself have a Scottish fold brought from Ukraine – he is the best partner for many many years! 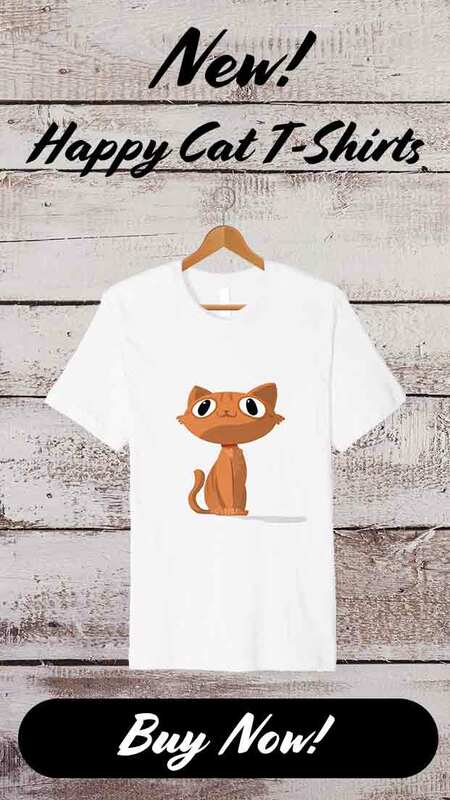 Hi, do you have a pair for your scottish fold? Hi, I recently got a munchkin kitten whose father is a Scottish Fold. My kitty does not have folded ears, and her mother is a munchkin cat. 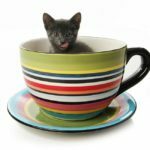 Will my kitty have joint problems? Is it less likely because it has unfolded, straight ears? I adopted a straight ear scottish fold cat. He’s is now 1 year and 8months old. He is very energetic, and playfull. I love him to bits. What’s the probability of him getting PKD and HCM, as well as joint diseases later in life? How old is he. I have a SF kitten who is 5 months old. I live in Dubai too. 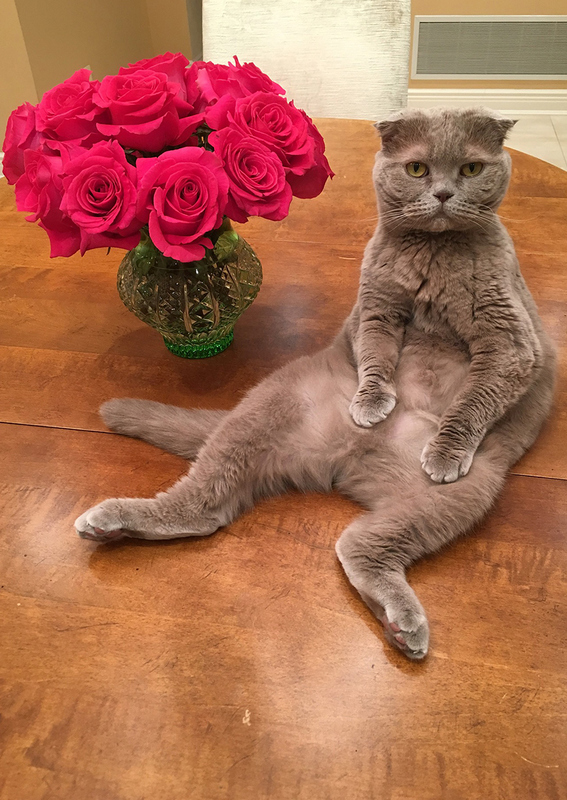 I recently got a straight Scottish fold female. If I breed her with another straight Scottish will she produce any folded kittens? No, you will only produce straight ear kittens. We took in a rescue SF. He’s pure white and had a troubled history having been abandoned twice.He is adorable, so calm, so polite even. We also live in Dubai, it seems there are blackmarket breeders based here as more are appearing. So so sad, but they command very high prices and some unscrupulous folk just look for profit. Our SF is such a treasure we recommend them completely, but look out for a rescue cat, they deserve a good home…. As a proud Scottish Fold owner I must list another downcome when it comes to having one of these with you. You will become so attached to him, and he will become so attached to you, that you will think there cannot be a sweeter cat on earth (and it’s probably true), and that you were somehow magically chosen to be given the opportunity to share a part of your life with him.. and it will be so devastating when the time of death inevitably comes that you will never be able to own another cat, because you know there will never be another one like him. 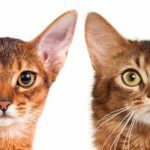 Abyssinian Cat Vs Somali Cat – Which One Is Right For You?